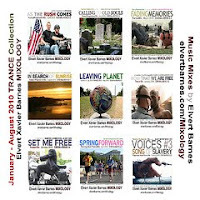 Shifting focus and gearing up for Labor Day Weekend and the Autumnal 2010 season I've just compiled my January - August 2010 TRANCE Collection which when burned onto a cd disc as mp3's includes nine (9) trance mixes from my Mixology 2010 archives. With each mix at approximately 80 minutes in length, when inserted into a TV or car dvd player almost 12 hours of non-stop music can be enjoyed. The 2010 House / Gay Circuit and New Age collections will follow over the next few days.